So I hear this a lot: "With HFT (High Frequency Trading), hedge funds, ETFs and instant trading via iPad apps (and mobile smart and dumb phones), the volatility in the stock market is intolerable. I can't take it anymore. I'm out!" Or, "with so many darn MBA's, PHD's and rocket scientists trying to outsmart the stock markets, the markets are way too efficient; there's no way to make money in the market anymore!" Or how about, "with the revolving door of government and Goldman Sachs, the insider connections, people on the outside don't stand a chance". Actually, I've been hearing these arguments for years. So the market is too volatile? Yes, with HFTs, hedge funds, ETFs and instant trading at any Joe Schmoe's fingertips, the market is prone to sudden, extreme, irrational moves (never mind that that's actually a *plus* for value investors). So check this out. 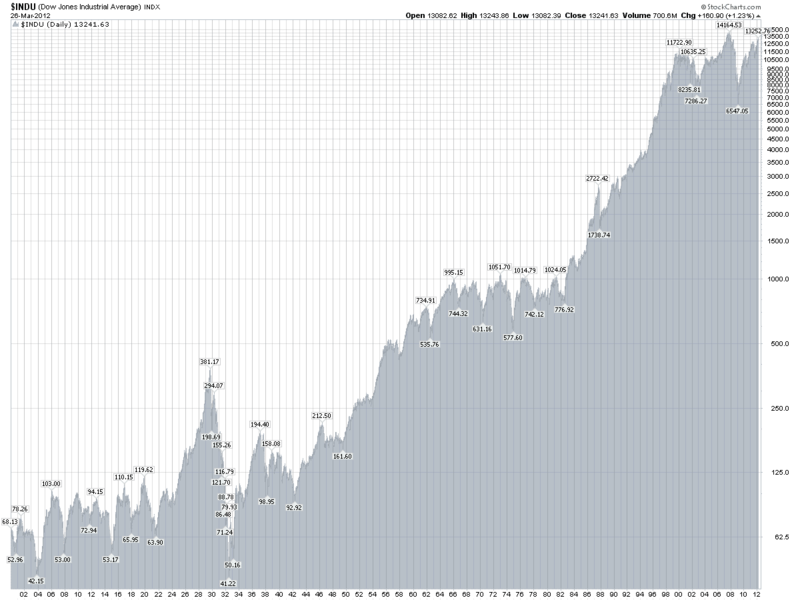 This is a chart of the Dow Jones Industrial Average going a long way back, all the way back to 1902, I think. That's more than 100 years of history. I look at this chart and scratch my head. OK, so where is the last five or ten years more volatile than the past 100 years? Sure, it's more volatile now than, say, the period between 1994 and 2000 when the market never declined more than 10% off the peak. Remember that period? I actually think that was the abnormal period. But what about the period from 1900 - 1950? That period actually looks a lot more volatile than now! And guess what? No hedge funds. No HFTs. No ETFs. Nobody can click a button on a cell phone and hit "sell everything NOW!". Nope. No futures or options. No ISDA-based OTC derivatives. No CMOs, CDOs, or CLOs. Not even any banks that are "too big to fail". Nope. None of that. In fact, for most of that period, the U.S. was on a gold standard. I remember back in the 1990s, people really feared a big, supercrash, much bigger than Black Monday that would be driven by the 1-800-GetMeOutNow mutual fund investors. The automation allowed anyone to dump their stocks/mutual funds with a single phone call. This scared the industry to such an extent that I think some mutual fund companies sought credit lines so they can borrow money to meet redemptions (so they won't have to sell into a crash). And this only got worse in the 1990s with the internet and online brokers. So in that sense, it's sort of remarkable that we had the worst recession/financial crisis/bear market since the Great Depression and the stock market only went down 50% off it's high, and we didn't even really have a 'crash' day. (What happened in 2007-2009 was far worse (in terms of the economy, banks etc.) than what happened in 1987). I remember last fall when the market was up 300 points one day and down 300 the next or some such. It was very, very volatile. But the market basically wasn't going anywhere. People who know I'm involved in the markets asked me, wow, it must be rough dealing with the markets. I was like, what do you mean? The market is not going anywhere! Up 300 one day and down 300 the next is only a problem if your job was to forecast the closing price every single day or you are a daytrader or whatever... or if you get fed up and dump your stocks on the 300 point down day and change your mind and get back in on the 300 point up day and keep repeating... Otherwise, it doesn't matter. I think someone asked Joel Greenblatt this question some time back when he was speaking at Columbia or somewhere (I wasn't there; I just read an article about it). Someone asked that if so many smart folks are rushing to Wall Street to work for these proprietary-trading-focused banks and hedge funds, isn't the market getting pretty efficient leaving less for anyone else? Greenblatt's answer was that this may be true in some areas of investing, but we still had the internet bubble in 1999/2000 (when these supposedly 'smart', highly educated people rushed into internet stocks). So go figure. A lot of hedge funds operate with different strategies. Maybe some spread businesses get tight (merger arbs, convertible arb etc...) with too much money going into it and a lot of funds these days seem to be sort of macro based, event-driven or whatever. And the ones people complain about are HFT-like; they trade so often they are only interested in mere basis points in 'edge', measured in microseconds or whatever. I know people bring up the flash crash as an example of computers run amok, but that to me is not a great example as I tend to think that was just a really simple, stupid mistake; somebody (especially the exchanges) just didn't have a filter that 'flagged' trades that didn't make sense (selling something that's trading at $50/share at $0.01 for example...). The exchange (and trading firm) should have had a simple screen to reject the trade and demand human intervention/confirmation. I remember when trading started to get automated on the street. There were usually all sorts of fat finger filters to prevent these really stupid errors. It's not rocket science. People used the flash crash to point out how the specialist system is better. But wait a second. What happened on Black Monday? Didn't people just refuse to answer the phone? Didn't the specialists just bid 20% below last trade? And if the specialist/NASDAQ market-maker system is so good and they provide 'liquidity' to the market for smooth price discovery and whatnot, how come stocks opens down 10% or 20% on some overnight news even when there is a specialist in charge of keeping 'orderly' markets? Where are the market makers then? This used to happen way before the HFT's started taking share away from the NYSE floor. I remember waiting for stocks to open down double digit percentages all the time; the specialist wouldn't open the stock until he had enough buy orders to offset the sell orders and he had to keep moving the price down. You call that providing liquidity to the market and keeping the market orderly? I'm not picking on the NYSE and specialists. I'm just trying to point out that it's really not that different; people complain that HFT's can just leave the market in times of turmoil, but my point is that it's not like the NYSE specialists and NASDAQ market-makers stepped up on Black Monday or other 'event' days to provide liquidity. The old system had their problems too just as the current system has problems. You will never make everyone happy. The interesting point, though, is that we haven't had a 20% down day *with* HFTs involved *despite* what we went through in the past few years. I do have an unproven theory why that might be. Why Didn't We Crash Big During the Financial Crisis?! Back in the old days, people had no *information*. People were blind. Only the privileged had information (if you were Gomez Addams, you had a private ticker tape in your house). When you called your broker and said you wanted to buy 100 shares of IBM, you were at the mercy of your broker and the folks on the floor of the New York Stock Exchange. And the only information you were going to get was in tommorow's newspaper; the opening price, high price, low price and closing price. When people are empowered with information, that allows people to react. They can see prices on their screen so when something goes down a lot during the day, they can buy some and not just run in blind fear. I have no proof, but I tend to think that things are much scarier when you just don't know. And when you don't know, the natural, reflexive action is to just get out first and think about it later. But that's just my theory on why we didn't have a huge crash in the last financial crisis. (Information is power!). The expectation was of massive, simultaneous liquidation including the pro-cyclical, volatility expanding leveraged ETFs. I hear some old school guys complain about the state of the financial markets including the relationship between brokers and clients and blaming the abolishment of Glass-Steagall, but I tend to point to deregulation of commissions in the 1970s and technology as the culprits (both of which I tend to think are good things, by the way). Way back in the old days, stock brokerage commissions were fixed so there was no price competition. It didn't matter where you traded so you looked for a relationship; whoever had the best service got the business because the prices were all the same. This is sort of like when bank deposit rates were regulated and banks fought for customers by giving away toasters. This changed in 1975 (May 1, 1975 otherwise known as May Day). This is the beginning of the propietariazation of Wall Street. If the brokerage business is not as profitable, then they have to put their own capital to work to make money. This, to me, is one of the big reasons why the industry has changed. Yes, there are minus factors to all of this (overtrading by retail investors), but I tend to like price competition and free flow of information. So this is another complaint that I hear about a lot, but frankly, I don't get it. I know, I know. People hate banks and bankers. It's Wall Street's fault for causing the housing bubble and then causing it to collapse. And yes, I'm just a bank loving, capitalist sympathizer. But I tend to think of it another way; the best and the brightest people often go to Wall Street. Yes, Wall Street causes trouble every now and then. But still, you tend to have a lot of smart, competent people there. The top school grads still (well, maybe less today) go there etc. OK, so some of the best and the brightest go to Goldman Sachs. Fine. And some of the best and the brightest go to Washington. Fine too. And then they hook up. What's wrong with that? People make it seem so evil if a GS guy becomes Treasury secretary and then hires ex-GS guys. It's a conspiracy. But wait a minute. If I took a government job and I needed to hire people to help me, why wouldn't I hire someone I trust? Why wouldn't those people be people I actually have experience working with? Or from an institution that I understand and where I come from? It's totally natural. I think it's a good thing that that happens, not bad. If, for example, a GS guy is not allowed to hire another GS guy, or another financial industry person, *that* would be a problem. How the heck is he going to find qualified people that he knows well and trusts?! So what I see going on is not a conspiracy but just a totally natural thing. I actually think it's good. Sometimes, I wish there was more back and forth between the private sector and public sector in Japan, for example. In Japan, bureacrats are professional bureacrats; they have never run anything in their entire lives and understand nothing about business or the real world. The only back and forth there is between government and business in Japan is "amakudari", or "descent from heaven" or whatever it was called: government officials get board seats at large corporations after retirement with great benefits. You'll never see a banker move to the Ministry of Finance, for example (at least at the minister level). That makes me go hmmm.... Maybe that's why they are having so much trouble over there. Anyway, there is a long history of people going back and forth between Wall Street and Washington, but I don't think that's because bankers want to go to Washington to represent their interest (even though that may be so in some cases). Many people, when they get really wealthy often want to do something else and try to help change the world for the better. I do believe that many go to Washington with good intent even though not everybody going there is Mr. Smith. This country was founded by various interests in the first place. Forgetting about, for the moment, whether any of this is good or bad, it's sort of always been this way and that's no reason to get in or out of the market. You could have said the same thing in 1930, 1940, 1950 or 1960 and I don't know that this revolving door is a reason to be in or out of the stock market. I don't mean to say everything is A-OK. I am just sort of pointing out the sameness of everything over time. Things just look a little different in every generation, but it sort of seems the same to me. Those who lack courage will always find a way to justify themselves. Brooklyn, just want to say that I enjoy your blog immensely. This post was a long one but I enjoyed each point. If you really want to see changes in vol over time, you should look at this data in logs, not levels. That would show a very different story. Hi, this chart already is a log chart; an inch on the chart is the same percentage change in 1930 and 2000 or wherever... Look closely and you'll see. Great post. Thank goodness someone in the financial blogosphere is finally saying what should be obvious to anyone with a bit of historical knowledge. I guess the Luddites, conspiracy theorists and Marxists will make the most of their receptive audiences during bear markets, because when the bull returns they will go back to being ignored.